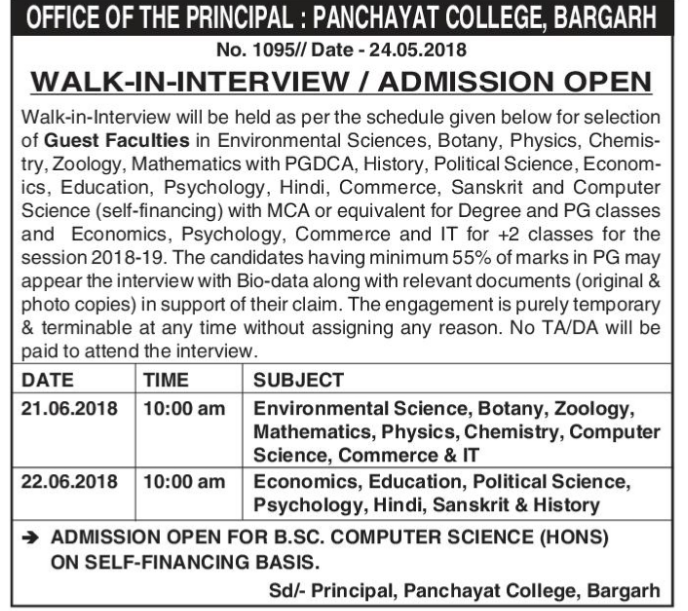 Panchayat College, Bargarh,has advertised in THE Samaja newspaper for recruitment of Guest Faculties jobs vacancies. Interested and eligible job aspirants are requested to attend interview on 21.06.2018,22.06.2018.Check out further more details below. 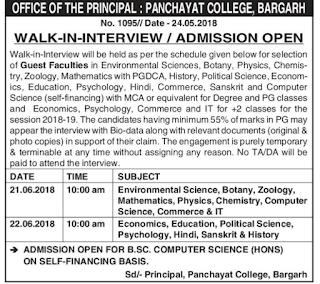 About College :Ever since its inception in 1960, Panchayat College, Bargarh, the only Government College in the district with a B+ NAAC Accreditation, has been serving as a beacon of light in the field of Higher Education to the generations of people in this remote area of Odisha. During the past fifty five years or so it has witnessed immense growth and development and has left its foot- prints on the sands of time. 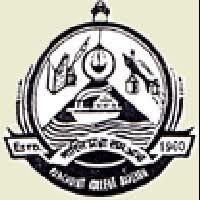 The college that has tremendous potentialities for an all round development needs a concerted effort by all its stake holders to groom it to usher in a new era of excellence in academic achievements so as to fulfill the long cherished dreams of the founders and the citizens of the locality. How to Apply: Interested candidates appear the interview with bio data along with relevant documents.Interview dated on 21.06.2018,22.06.2018.